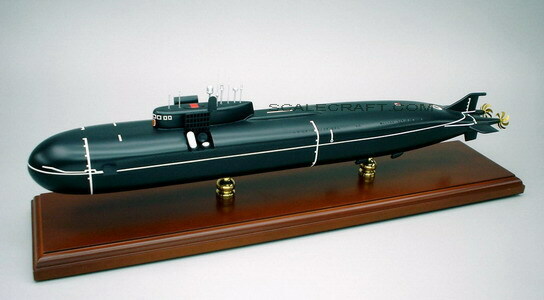 K-141 Kursk was a Russian nuclear cruise missile submarine which was lost with all hands when it sank in the Barents Sea on August 12, 2000. Kursk, full name Àòîìíàÿ ïîäâîäíàÿ ëîäêà "Êóðñê" [ÀÏË "Êóðñê"] in Russian, was a Project 949A Àíòåé (Antey, Antaeus but was also known by its NATO reporting name of Oscar II). It was named after the Russian city Kursk, around which the largest tank battle in military history, the Battle of Kursk, took place in 1943. One of the first vessels built after the fall of the Soviet Union, it was commissioned into the Russian Navy's Northern Fleet. Mahogany wood. Scale: 1/240. Length 25 1/2 inches.